The Tree of Life is an important and powerful symbol in nearly every culture. With its branches reaching into the sky, and roots deep in the earth. It is both a feminine symbol, bearing sustenance, and a masculine, visibly phallic symbol- another union. In the painting this is depicted as images of both masculine and feminine bodies joining together in yes, another union. The tree has other characteristics, which lend easily to symbolism. Many trees take on the appearance of death in the winter- losing their leaves, only to sprout new growth with the return of spring. This aspect makes the tree a symbol of resurrection. A tree also bears seeds or fruits, which contain the essence of the tree, and this continuous regeneration is a potent symbol of immortality. This aspect of the tree as a giver of gifts and spiritual wisdom is also quite common. It is while meditating under a Bodhi tree that Buddha received his enlightenment. Is waiting for you to remember your relation in Creation. The circle and flame an infinite share. All the elements are here. 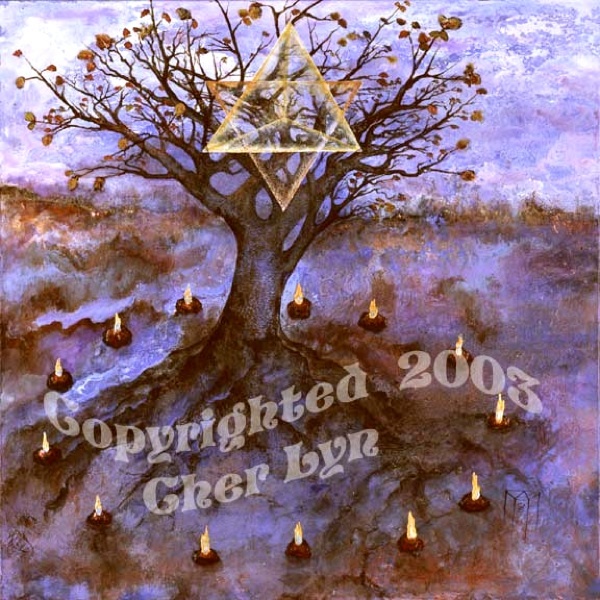 In the painting of “Initiation Tree” the symbol of the six pointed Star Tetrahedron or Merkabah is an ancient sacred geometry of Lemuria, a powerful symbol of creation. The star tetrahedron is the symbol of perfect material manifestation. Known by many names such as the star of Atlantis, seal of the gates, seal of Solomon, star of David. In present is most commonly linked our Hebrew traditions but this old language and philosophy came from Egypt and the mystery schools, I feel it is from our memories of the Stars. It is the unification of duality, masculine and feminine energies woven together. Cinnabar circled in flame thirteen times round signifies the ceremony of the Initiation, opens the portal and solidifies a safe and sacred space. Thirteen is the vibrational force that is found in all things, the source of all knowledge in the galaxy, and is representative of movement. Some seers have crossed the illus ional barrier of time and discovered in the Heavens, a Tree of Life, perhaps this tree can be found in the number thirteen. The Initiation Tree of Life finds its home in the Earth’s Soil, Fire, Water, Air and the cosmos. It continues to give birth to itself through the many connected root systems that are hidden below the ground and the seeds that it sends upon the winds of the sky. This process is repeated in multiple dimensions of reality and they are all connected to the original tree. Like probes that are sent out to all life bearing planets and dimensions the Initiation Tree is the eyes, ears, and heart of heaven. Our memory is not something static that petrifies and stores in the inner museum of our being. We already have everything we need for life inside of us. If we do not act upon these memories, we will fail to truly live in this transient world. On the onset, initiation can feel like a set of weird, unconnected events, yet eventually we see their results bring us into a state of surrender and then later, contentment. All is well. Stuff is always coming up to take a look at, re-examine and either toss-out, heal or transcend. There could be a lot of unconscious resistance taking place; there could be a great deal of fear to overcome. No one can tell us how to live or who we are. That knowledge can only be found within. To deny our selves our true nature can only cause tremendous pain. We must travel to the other side of fear in order to arrive in our true transformation. A process of relearning, enforcement of these lessons and a consolidation of new knowledge anchors in the return of self, the divine within. There is more to the modern world then meets the naked eye, there are barriers to human physical sight and our seeing is, let’s say less than optimal. Human sight stops seeing where the conditioned mind says it should. And it is that way in the moment for a reason; all our senses would be overwhelmed and daily routine of business and such of living would never get done, if we truly could see all that surrounds us in our world on the other levels and dimensions. However, there comes a time when one must learn to move between worlds, the various ways of perceiving and our conditioned mind, consecutively to become more whole. Expanding our vision through Initiation has nothing supernatural about it; on the contrary it is natural to be a part of nature and to participate in a wider understanding of reality. Going deeper with our meditation practice is important, or finding one that works, being with our commitment to make this our highest prerogative to be more dedicated then ever to our self-love. It is here that we will locate and initiate the peace within. Be mindful not to ‘over-think’… this is very seductive and mostly an energy-snatcher… be aware and focused in heart wisdom. It will guide with clarity. All this is in perfect timing and there is absolutely no mistake about it! Upon completion of an initiation it is important to remember to be gentle with oneself, this could be a vulnerable time, getting through the critical stage, be mindful to honor the journey.